Can dogs eat cherries? 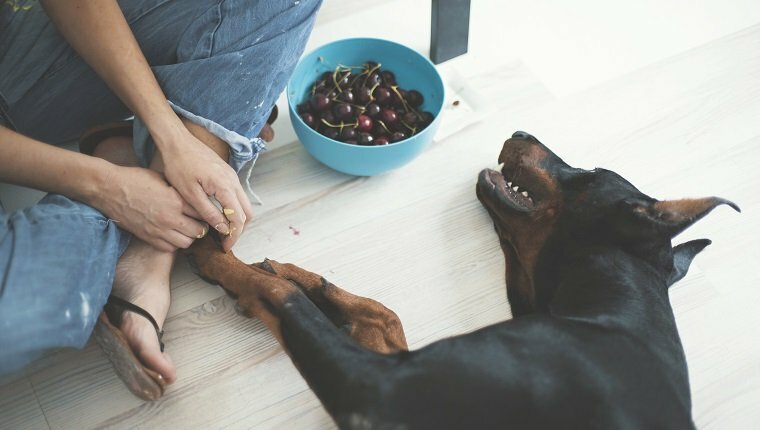 The short answer is no, dogs shouldn’t eat cherries, even though your dog may have eaten a cherry or two in the past and felt fine afterward. Many fruits are healthy and safe for dogs, but while cherries do contain some beneficial nutrients, they can do a lot more harm than good and usually aren’t worth the risks. There are plenty of human foods that are good for dogs and make for better choices than cherries. 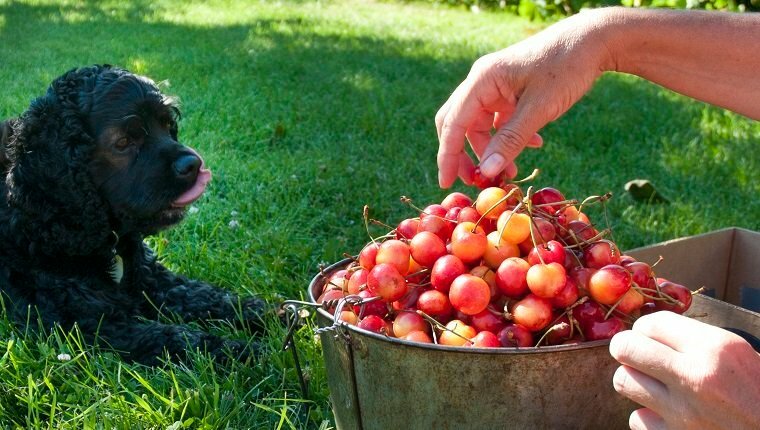 Here’s what you should know when it comes to dogs and cherries. Why Are Cherries Bad For Dogs? The pits, stems, and leaves of cherries all contain cyanide, which is toxic and can cause poisoning in dogs if consumed in large quantities. Although the amount of cyanide in one or two cherries probably isn’t enough to do serious damage, there is no need to risk poisoning when there are plenty of alternatives to cherries that can provide the same health benefits your dog might get from them. Cherry pits are also a problem for dogs, as they can cause intestinal obstruction. 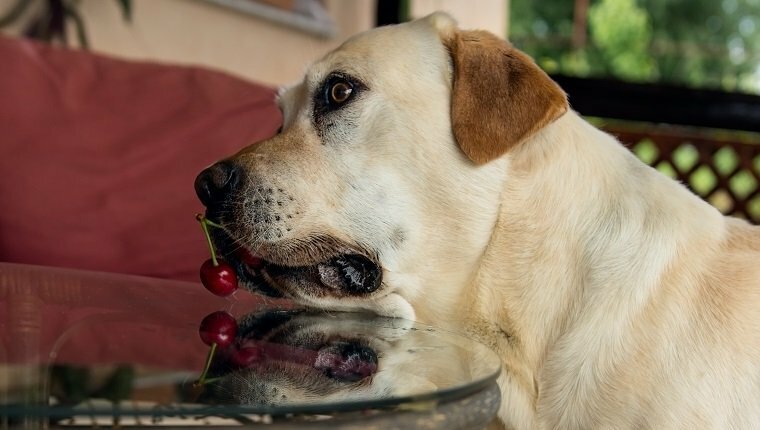 This is the most common problem dogs have when eating cherries, and it is a serious issue that can lead to some nasty complications. Even if the pit is not eaten, cherry fruit can lead to gastrointestinal upset in dogs. What About Maraschino Cherries, Cherries Without Pits, Or Cherry Flavored Foods? Maraschino cherries are the sweet fruits you often see served in drinks, and they do not have their pits. Sometimes the stems are also removed. The main problem is that maraschino cherries are loaded with sugar, which is not good for dogs. To much sugar can cause diabetes or obesity in the long term and gastrointestinal issues in the short term. Cherries that have been de-pitted and have their stems removed may be a better option for dogs. Cherries have vitamin A and C, fiber, antioxidants, melatonin, and other potentially beneficial nutrients. 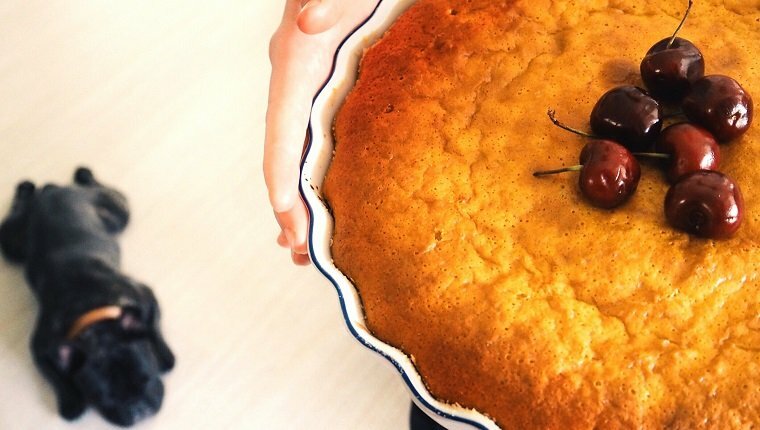 That said, there are plenty of other fruits and foods available that do not come with the risks associated with cherries, nor do they require you to go through the hassle of removing the pits. Apples served without the core or seeds, for example, also have fiber and vitamins. Blueberries contain plenty of antioxidants. These fruits do contain sugar and may upset some dogs stomachs, so they aren’t for every dog and shouldn’t be given in large quantities, but they are a safer option than cherries and can have great health benefits when served to dogs safely. You should consult your veterinarian before giving your dog these foods. Cherry flavored foods are usually full of artificial flavoring, chemicals, and sugar. These are not good for dogs. Even foods that are naturally flavored with real cherries are often quite sugary. It’s best to stick to real foods that have ingredients that you are familiar with and are known to be safe for canines. You can ask a nutritionist or your veterinarian for further advice on which foods are safe and healthy for your dog. What Should You Do If Your Dog Eats Cherries? One or two cherries shouldn’t cause much damage. However, you should still keep an eye out for signs of cyanide poisoning in your dog. The risk for poisoning is higher the more cherries your dog eats. Symptoms of cyanide poisoning in dogs include difficulty breathing, bright red gums, dilated pupils, and in serious cases, dogs can go into shock. Dogs may also suffer from an upset stomach or diarrhea. If you see any of these symptoms, contact your veterinarian right away. The greater concern when your dog only eats one or two cherries is the potential gastrointestinal obstruction from the cherry pits. Symptoms of gastrointestinal blockage include constipation, decreased appetite, and vomiting. You should keep an eye out for these symptoms for at least 24 hours after your dog has eaten cherries. If you do spot the signs of a gastrointestinal blockage, get to the vet as soon as possible. What kinds of fruit do you like to give your dog instead of cherries? Let us know in the comments below!